LOUISVILLE, KY (March 31, 2016) PowerBilt®, one of golf’s oldest and most respected club brands, has named Hireko Golf as its new licensee for the United States. Hireko, based in City of Industry, California is one of the leading component companies in the golf industry. The company looks to leverage its robust and expanding customer base to grow the PowerBilt brand and re-position it for mass appeal. Hireko was established in 1982 and has developed a robust and loyal customer base over the past 34 years. Its services include wholesale distribution, OEM design/manufacturing, and third party fulfillment. The company has developed a reputation as a leading one-stop shop, and it has a strong business-to-business presence through its www.Hirekogolf.com e-commerce website, as well as through mail order catalogs and flyers. With the addition of PowerBilt, Hireko has developed a branded web site at www.powerbilt.com where all PowerBilt products can be found. The company’s product lines include custom clubs, clubheads, shafts, grips, bags, headcovers, and accesserories and, now with the addition of PowerBilt, metal woods, complete irons sets and box sets including men’s women’s and juniors, among other PowerBilt products. Hireko’s recreational golfer strategy includes taking PowerBilt clubs into big box, off-course specialty stores, and green grass. The company plans to do that by building a traditional sales force of independent representatives. Taking PowerBilt into new markets is also expected to open opportunities for Hireko to expand its existing component business as new customers learn of the company’s numerous offerings. Edlin says it’s a great partnership that’s a win-win for both PowerBilt and Hireko. Augusta, GA – March 30, 2016 – The Augusta Warrior Project (AWP) announced today their partnership with the Veteran Golfers Association (VGA) on their 2016 Tuesday for the Troops Annual Golf Fundraiser and Military Appreciation Day for Augusta during the week of the Masters. The golf tournament will be held at the Jones Creek Golf Club in Augusta, GA on Tuesday, April 5th, 2016 starting at 8am. After the tournament, attendees will then have the opportunity to watch the Tuesday practice round at the Masters followed by dinner at The Azalea House at 7:30pm. Proceeds from the event will benefit the Veteran Golfers Association. Confirmed celebrity attendees to date include: Randall McDaniel, NFL Hall of Famer and 12x Pro Bowl; Plaxico Burress, Former NFL WR & Super Bowl Champion; Russ Ortiz, Former MLB P & All-Star; DJ Irie, Official DJ of the Miami Heat; Alan Kournikova, Top Junior Golfer in the World; Alexa Pano, Top Junior Female Golfer in the World; LTG Mike Ferriter, retired 3-star General; Theo Ratliff, Former NBA C & All-Star; and more. The Augusta Warrior Project is focused on providing community leadership by partnering with other Veteran’s Service Organizations and the local community to tie Veterans with access to services, benefits, and housing to help improve their lives. AWP seeks to serve all veterans from all eras whether wounded or not and currently serves 13 counties in the Augusta, GA and Aiken, SC areas. For more information on the2016 VGA Tuesday for the Troops golf tournament, please visit vgagolf.org For more information on the Augusta Warrior Project please visit AugustaWarriorProject.org. Augusta Warrior Project (AWP) connects Warriors (veterans, service members, and military families) with resources that improve their lives. AWP serves all Warriors, of all eras, from all branches of service, wounded or not. AWP’s service area covers 13 counties in the area surrounding Augusta, GA and Aiken, SC. AWP connects Warriors to resources, educates Warriors on what is available to them, advocates on the Warriors behalf, and collaborates with partnering agencies to ensure all needs are met. To learn more about AWP visit www.AugustaWarriorProject.org. The VGA is a 501 (c) (3) nonprofit organization committed to promoting the game of golf to veterans and their family members. The VGA develops programs that allow its members to compete, socialize and remain physically active through the game of golf. For more information visit us at www.vgagolf.org. The VGA provides competitive golf leagues for veterans and their families across the country, including the VGA Tour. Veterans interested in joining the 2016 VGA Tour can visit vgagolf.org to sign up. More information on the 2016 VGA Tour and the championship event at Pinehurst is available at www.vgachampionship.org. RANCHO MIRAGE, CALIFORNIA, MARCH 28, 2016 – Andrea Lee, a 17 year-old from Mira Costa High School in Hermosa Beach, Calif., today secured a coveted invitation to play in golf’s first major of the 2016 season. Lee claimed the final place in a field of 115 at this week’s ANA Inspiration after carding an impressive 5-under par, 67, to win the expanded ANA Junior Inspiration by a sizeable 3 shots. Lee will now tee off alongside the best women’s golfers in the world when the tournament begins this Thursday, March 31 in Rancho Mirage. After failing to make the cut last year at the ANA Inspiration as an invited amateur, the young star showed outstanding resilience today on her return to Mission Hills Country Club. This time competing on the Palmer Course and against an expanded field of elite juniors, Lee successfully booked her place in the starting field and earned the right to enjoy another golfing experience of a lifetime. For the first time in the history of the newly-named ANA Junior Inspiration, the field included eight special invitees from across North America. Each of these junior players represented one of All Nippon Airway’s (ANA) gateway cities in North America – Chicago, Honolulu, Los Angeles, Seattle, San Francisco, San Jose, Vancouver, Washington D.C. Historically, the ANA Junior Inspiration consisted of the best young golfers from California, but with the support of ANA, the opportunity to vie for a spot in the LPGA’s most iconic major championship was extended to additional deserving junior golf hopefuls. Each group of junior players competing in the ANA Junior Inspiration today was paired with a former ANA Inspiration champion for coaching and mentoring throughout the event. LPGA Hall of Fame legend Pat Bradley had the chance to work closely Lee on the practice range and during Monday’s round providing valuable guidance and inspiration to the next generation of golf stars. Former champion Bradley, who won the tournament in 1986, turned the clock back 30 years at the scene of her memorable victory to successfully mentor and guide eventual winner Lee around the Palmer Course. Lee’s journey to the ANA Inspiration is just beginning as she has also been invited by ANA to attend the Champions Dinner taking place this evening and the pro-am on Wednesday, March 30. On Thursday, she will tee it up with the best players on the LPGA tour to compete for the title of 2016 ANA Inspiration champion. 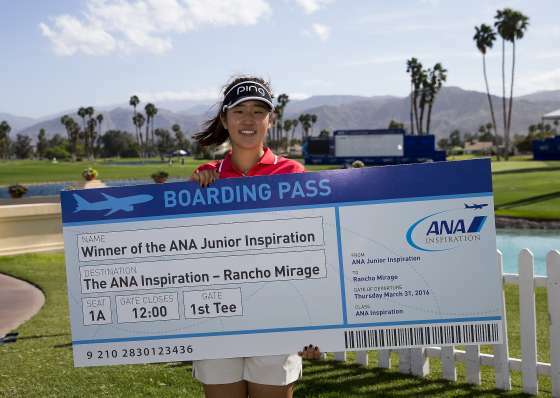 ANA, Japan’s leading airline, announced its partnership with the LPGA in 2014 to become both the title sponsor of the first major of the season and the Official Airline of the LPGA. “Inspired Journeys” serves as the spirit of the tournament and ANA looks forward to again reaching a global audience with the ANA Inspiration while maintaining the long-standing traditions of the championship. For more information about the ANA Inspiration, visit www.anainspiration.com. The ANA Inspiration is golf’s first major and one of the LPGA Tour’s most prestigious events. Previously known as the Kraft Nabisco Championship, the tournament was founded in 1972 by David Foster and Dinah Shore and earned the designation as a major championship in 1983. Contested at Mission Hills Country Club in Rancho Mirage, Calif., since its inception, the ANA Inspiration holds the distinction of being the second oldest golf tournament continuously held at the same course. For many, the event is most distinguished by one of golf’s most beloved traditions: the champion’s leap into Poppie’s Pond, located adjacent to the 18th green. In 1988, the first champion’s leap into Poppie’s Pond was taken by Amy Alcott, and since has become one of the most anticipated and memorable traditions in golf. For more information on the ANA Inspiration, please visit www.ANAInspiration.com or call 760-834-8872. On social media, visithttps://www.facebook.com/ANAinspiration, www.twitter.com/ANAinspiration or https://instagram.com/anainspiration. (PETOSKEY, Mich.) – BOYNE Golf – home to 10 premier courses spanning three resorts in the heart of “America’s Summer Golf Capital” – is planning a season to remember in 2016. BOYNE Golf plans to roll out several anniversary-themed promotions in the coming months. The first is $50 rounds on The Heather on June Thursdays after 1 p.m. The offer must be booked on online:www.boyne.com/golf/Heather50 (Promo Code: Heather50th). Not to be outdone, Bay Harbor Golf Club – which brought the first lakeside, five-star resort golf experience to the region – will commemorate its 20th year in operation. With three distinct nine-hole courses all designed by Arthur Hills (The Links, The Preserve and The Quarry), Bay Harbor Golf Club is regularly ranked among the country’s Top 100 courses by Golf Digest and GOLF Magazine. BOYNE Golf Academy will once again offer a full menu of instruction programming, including its new Power Clinic, which will focus on techniques to hit the ball further off the tee. Scheduled for June 11, July 9, July 23 and August 6, the one-day sessions are capped at a 4:1 student-to-instructor ratio and priced at $799 per person. They include a comprehensive evaluation using the Academy’s GEARS Golf system, swing analysis on a TrackMan launch monitor, Titleist Performance Institute (TPI) physical assessment, round of golf with on-course instruction, and more. Further evidencing BOYNE’s reputation for embracing golf innovation are the return of GolfBoards to Boyne Highlands and introduction of 140 new state-of-the-art EZ-GO carts at Boyne Highlands (80) and Boyne Mountain (60). GolfBoarding is an entirely new way to traverse the golf course. The four-wheel drive board allows users to turn by simply transferring their body weight in a carving motion akin to snowboarding or surfing. GolfBoards will once again be available to golfers playing the Donald Ross Memorial and The Moor courses. The new EZ-GO RXV golf carts offer the latest advances in cart technology, including a USB port to recharge mobile phones, rangefinders, iPads, and other small electronics. DAYTONA BEACH, Fla., MARCH 17, 2016 – The Ladies Professional Golf Association (LPGA) announced today that Jeju SamDaSoo, the leading water company in South Korea, has joined the LPGA family as an Official Marketing Partner with the designation as the Official Water of the LPGA. As an official partner of the LPGA, Jeju SamDaSoo will introduce the No. 1 bottled water in Korea to the LPGA Tour. From players and caddies to the fans of the LPGA, all will have access to this great tasting water at designated LPGA events. Jeju SamDaSoo will also headline a “Refreshing Round of the Day” feature on Golf Channel which will highlight a player with a phenomenal round from that day’s telecast. In addition to the Golf Channel features, Jeju SamDaSoo will have a presence throughout the LPGA season with digital integration on LPGA.com, consumer sampling locations and branding and product placement on-site at designated tournament events. Jeju SamDaSoo was introduced to the LPGA by Rolex Rankings No. 2 Inbee Park. Jeju Special Self-Governing Province Development Corporation is a local public enterprise whose establishment was fully funded by Jeju Special Self-Governing Province in 1995 to effectively promote local businesses towards the betterment of Jeju’s inhabitants. Through “Jeju SamDaSoo”, our spring water business, “Jeju Gamgyul”, our mandarin orange juice business, and housing and land development businesses, we have contributed to the improvement of local society. Jeju SamDaSoo, especially, has stoutly maintained the number one spot in its field of business since its market introduction, and has played a pivotal role towards the “1 Trillion Era” goals of the Jeju Water industry by extending its operations into overseas markets which include the U.S., China, and Japan. Golf’s oldest major, the 145th Open Championship at Royal Troon, is a mere four months away. Now is the time to book a golf vacation to the West Coast of Scotland through Golfbreaks.com. Enjoy the world’s finest links golf while watching four days of Open Championship action. CHARLESTON, SC (March 2016) — For more than 150 years, the world’s best players have battled the unrelenting challenge of links golf at the Open Championship — the game’s oldest major. This year, renowned Royal Troon plays host to the event for the ninth time. Troon is located in links golf paradise on Scotland’s Ayrshire coast; surrounded by the likes of the remodeled Turnberry, Prestwick, Western Gailles and Dundonald just down the road, not to mention Machrinanish Old. Ayrshire offers the visiting golfer perhaps the finest collection of links golf courses in the world, along with easy access, quality accommodations, fine dining, and a history and heritage to match. Golfbreaks.com recommends that you make a trip out of this year’s Open Championship at Royal Troon: Watch four days of major championship golf while you also play some world-class links golf, and enjoy the hospitality and entertainment in the city of Glasgow. You can experience the magic of The Open in Scotland with several Golfbreaks.com packages. Let Golfbreaks.com know your requirements and their experts will design an ideal Open Championship experience. Golfbreaks.com is offering four-night British Open 2016 packages starting at $2,310 per person that include four nights’ accommodation in a four-star Glasgow hotel, full Scottish breakfast, official tickets for four championship days of the British Open, as well as transportation to and from the Open Championship. Golfbreaks.com’s British Open seven-night package starts at $3,485 and includes all of the above, along with three rounds of golf on famous links courses such as Turnberry Ailsa, Western Gailes, Gailes Links, Dundonald Links, Kilmarnock Barassie, Irvine Bogside, Kilmarnock Barassie or Prestwick. Learn more about the Open Championship package at http://usa.golfbreaks.com/vacations/the-open/. Steeped in Open Championship history, Royal Troon is not a venue to be missed. In 1923, Troon replaced Prestwick on the Open rotation for the first time and became a regular venue with a list of champions that includes Bobby Locke, Arnold Palmer, Tom Weiskopf, Tom Watson, Mark Calcavecchia and Justin Leonard. Most recently, the Open Championship was played at Royal Troon in 2004, when American Todd Hamilton topped three-time major champion Ernie Els in a playoff. To attend the Open Championship this year and witness this magical event yourself, call a Golfbreaks.com expert at (855) 699-5853 or visit USA.Golfbreaks.com. Golfbreaks.com (established in 1998) is a specialist golf travel company, with its headquarters in Windsor, UK, and offices also in Charleston, SC, and Copenhagen, Denmark. Its aim is to save golfers time and money, by providing a unique one-stop service that makes booking golf vacations as simple as possible. With an expert team that is passionate about golf and travel, the company is known for delivering outstanding service at unbeatable prices. Golfbreaks.com is an Official Partner of The PGA of Great Britain & Ireland, the European Tour and also GolfNow, the leading tee-time booking and golf course technology and services platform. Learn more at (855) 699-5853 or USA.Golfbreaks.com. RANCHO MIRAGE, CALIFORNIA, March 9, 2016 – The world’s best golfers will not be the only champion female athletes at this year’s ANA Inspiration, as tournament officials last night announced the first-ever ANA Inspiring Women in Sports Conference, slated for Tuesday, March 29 at Mission Hills Country Club. Female sporting icons Missy Franklin, Annika Sorenstam, Lindsey Vonn, Abby Wambach and Kristi Yamaguchi will headline the inaugural conference, which will include a series of panels and discussions about the state of women’s sports, female athletes as role models, using sports as a platform to inspire women of all ages, and what it takes to be a champion. Swimmer Jessica Long will also share her inspiring story of overcoming a double leg amputation at 18 months old to become the one of the most decorated Paralympians in history. The announcement of groundbreaking new ANA Inspiring Women in Sports Conference was made at a special launch event held in Beverley Hills attended by defending ANA Inspiration champion Brittany Lincicome alongside LPGA stars Cristie Kerr and Alison Lee, two-time Olympic gold medalist and two-time FIFA Women’s World Cup Champion Julie Foudy and world-class swimmer and 12-time Paralympic gold medalist Jessica Long. Arianna Huffington, the co-founder, president and editor-in-chief of the Huffington Post Media Group, and author of 15 books, will deliver the keynote address on the habits of successful women. Foudy will serve as host and moderator. Wambach, a two-time Olympic gold medalist and 2015 FIFA Women’s World Cup champion, will accept the inaugural ANA Inspiration Award, which is given to a female athlete, entrepreneur or philanthropist who, through her effort and determination on or off the playing field, has inspired other women to break barriers and achieve success. Produced by IMG, the conference will take place in the all-new ANA Hospitality Pavilion adjacent to the 18th green of the Dinah Shore Tournament Course and Poppie’s Pond. In 1988, three-time ANA Inspiration winner Amy Alcott made the first-ever champion’s leap in Poppie’s Pond, thus inspiring the LPGA’s most recognizable tradition that carries on to today. LPGA player panelists and additional contributors for the conference will be announced in the coming weeks. At the conclusion of the ANA Inspiring Women in Sports Conference, the first-ever ANA FootGolf Challenge will take place on the adjacent Palmer Course at Mission Hills Country Club. American soccer legends Wambach and Foudy will team up with two American LPGA players in a six-hole competition against Japanese National Team legends Ayumi Kaihori and Yayao Kobayashi and two of their Japanese compatriots from the LPGA. FootGolf, the hybrid sport where soccer meets golf, is played with a regulation soccer ball on shortened golf holes with 21-inch diameter cups cut into the greens. The rules largely correspond with the Rules of Golf. The American FootGolf League (AFGL), which is based in Palm Springs, will oversee the setup of the ANA FootGolf Challenge course and competition. The conference will take place in advance of the season’s first major where defending champion Brittany Lincicome will seek to become the fourth player in LPGA history to win the ANA Inspiration three times. She will be joined by Rolex No. 1 Lydia Ko, No. 2 Inbee Park, No. 3 and 2014 champion Lexi Thompson, No. 4 and 2011 champion Stacy Lewis and No. 5 Ha Na Jang, a two-time winner on Tour in 2016. 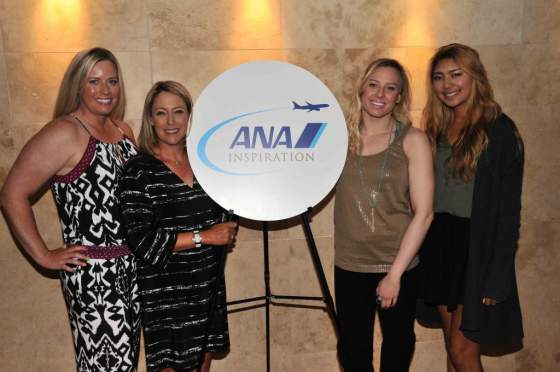 The full field for the 2016 ANA Inspiration will be announced on Tuesday, March 22. Speaking on the new initiatives for 2016 ANA Inspiration defending champion Brittany Lincicome said: “The ANA Inspiration is very special to me. Last year everything felt like it had been upgraded as ANA added lots of touches and went above and beyond for the players. But with the new additions to the tournament line-up this year looks even better. I’m really looking forward to the ANA Inspiring Women in Sports Conference. When you meet another athlete at the top of their game it gives you cold chills. I’m not sure I’ll know what to say but I can’t wait to meet such inspiring women especially when I’m returning as the defending champion. I know it’s going to be real highlight. Missy Franklin won five Olympic medals – including four gold medals – at the 2012 London Olympic Games where she also set the world record in the 200-meter backstroke at the age of 17. She opted to forego immediately turning professional, instead joining the women’s swim team at the University of California, Berkeley. She will head to the 2016 Rio Olympics as a professional. Arianna Huffington is the co-founder, president, and editor-in-chief of the Huffington Post Media Group, and author of fifteen books. In May 2005, she launched The Huffington Post, a news and blog site that quickly became one of the most widely-read, linked to, and frequently-cited media brands on the Internet. In 2012, the site won a Pulitzer Prize for national reporting. She has been named to Time Magazine’s list of the world’s 100 most influential people and the Forbes Most Powerful Women list. Originally from Greece, she moved to England when she was 16 and graduated from Cambridge University with an M.A. in economics. At 21, she became president of the famed debating society, the Cambridge Union. Jessica Long is a world-class swimmer and 12-time Paralympic gold medalist. Born with fibular memimelia, she was adopted from a Russian orphanage at 13 months old and had the lower portion of her legs amputated at 18 months old. She was active in numerous sports growing up, but began swimming competitively at age 10 and made her first international appearance at the 2004 Paralympic Games in Athens, Greece. In 2007, at the age of 15, she became the first Paralympian to win the AAU Sullivan Award, given to the nation’s top amateur athlete. Annika Sorenstam is the greatest female golfer of her generation, and often regarded as the best in history. During her 15-year Hall of Fame career, she re-wrote the LPGA and LET record books, winning countless awards and changed the way golf was played, viewed and covered. She retired from the game in 2008 with 90 worldwide victories including 72 LPGA wins and 10 major championships. A member of the LPGA and World Golf Halls of Fame, she was an eight-time Rolex LPGA Player of the Year, six-time Vare Trophy winner for lowest scoring average. She has gone on to pursue a successful business career including golf instruction, golf course design, television work and support of the ANNIKA Foundation. Lindsey Vonn is the most successful female ski racer in the world and one of the most marketable athletes globally. She is the only American to capture downhill gold at the Olympics and the only American woman with four World Cup titles. In addition to her 2010 Olympic golf and super G bronze, she holds five World Championship medals, including double gold in 2009. Abby Wambach is regarded as one of the greatest soccer players of all time. Known in particular for her goal-scoring ability, she is a two-time Olympic gold medalist and a member of the victorious U.S. Women’s Soccer Team at the FIFA Women’s World Cup in 2015. The 2012 FIFA World Player of the Year retired from competitive soccer last year as the all-time leader in international goals with 184. Kristi Yamaguchi is the winner of the 1992 Winter Olympic gold medal in figure skating. After her Olympic win, Yamaguchi toured with Stars on Ice from 1992 until 2002. She was inducted into the U.S. Figure Skating Hall of Fame in 1998 and the World Figure Skating Hall of Fame in 1999. She was a Goodwill Ambassador at the 2002 Olympic Winter Games in Salt Lake City, Utah, and in 2005 she was inducted into the U.S. Olympic Hall of Fame. In 1996, Yamaguchi founded the Always Dream Foundation, a nonprofit organization that serves underprivileged, disabled and at-risk youth. The ANA Inspiration is golf’s first major and one of the LPGA Tour’s most prestigious events. Previously known as the Kraft Nabisco Championship, the tournament was founded in 1972 by David Foster and Dinah Shore and earned the designation as a major championship in 1983. Contested at Mission Hills Country Club in Rancho Mirage, Calif., since its inception, the ANA Inspiration holds the distinction of being the second oldest golf tournament continuously held at the same course. For many, the event is most distinguished by one of golf’s most beloved traditions: the champion’s leap into Poppie’s Pond, located adjacent to the 18th green. In 1988, the first champion’s leap into Poppie’s Pond was taken by Amy Alcott, and since has become one of the most anticipated and memorable traditions in golf. For more information on the ANA Inspiration, please visit www.ANAInspiration.com or call 760-834-8857. On social media, go to https://www.facebook.com/ANAinspiration, www.twitter.com/ANAinspiration or @ANAinspiration on Instagram. (DULUTH, GA) – Premier Golf (www.premiergolf.com) – North America’s exclusive supplier of Ryder Cup packages since 1991 – emphasizes a luxury experience by offering two Ryder Cup packages that include admission to the Premier Golf Hospitality Chalet during the 41st biennial international competition at Hazeltine National Golf Club in Minnesota, Sept. 27-Oct. 2, 2016. Designed to be the quintessential Ryder Cup experience of a lifetime, this package includes four nights’ accommodations at the JW Marriott Hotel (Bloomington), round-trip transportation to Hazeltine National, daily breakfast, event admission (Thurs-Sunday), welcome reception, Ryder Cup commemorative gift and last but not least, Saturday and Sunday access to the exclusive Premier Golf Hospitality Chalet. Cost is $6995 double occupancy; $8195 single occupancy. Practice rounds at the Ryder Cup present an opportunity to watch the best players in the world play in a relaxed, less-formal setting. Crowds are smaller, autographs are easier to obtain and coveted Ryder Cup merchandise is readily available. Package includes two nights’ accommodations at the Mystic Lake Casino Hotel, daily admission to Wednesday-Thursday practice rounds and Opening Ceremonies, preferred parking at Hazeltine National, commemorative Ryder Cup gift and access to the Premier Golf Hospitality Chalet (Wednesday-Thursday). Cost is $1400 double occupancy; $1650 single occupancy. Located on Hazeltine’s 16th hole, the Chalet includes air-conditioning, wide-screen televisions, daily buffets, a full-service open bar, executive restrooms, maps and pairing sheets, daily gifts, recognition on welcome signage and a dedicated on-site staff. A limited number of 100 persons will be granted access each day during the week. Premier Golf also offers custom “Ryder Cup Extensions” for destinations such as Pinehurst, Destination Kohler and Streamsong including accommodations, tee times, transportation and non-golf activities. About Premier GolfPremier Golf LLC is a division of Travel Incorporated headquartered in Duluth, Georgia. The company has been licensed by the PGA of America since 1988 and manages several of the PGA’s travel requirements. Since 1991, the company has been the only licensed source by the PGA for official Ryder Cup travel packages. Premier Golf is also one of America’s largest and most respected golf tour operators. With offices in Ireland and Scotland, Premier Golf provides golf travel services to the classic destinations all over the world. For more information: www.premiergolf.com, 866.260.4409. (ST. AUGUSTINE, Fla.) – WE ARE GOLF – a coalition of the game’s leading associations and industry partners – today announces 2016 U.S. Ryder Cup Captain Davis Love III and Vice Captain Steve Stricker will be attending National Golf Day on Wednesday, May 18. A native of Sea Island, Ga., Love won a total of 21 events on the PGA TOUR, including the PGA Championship (1997) and THE PLAYERS Championship (1992, 2003). He also participated on six Ryder Cup and six Presidents Cup teams. During his career, Love attained status as No. 3 in the Official World Golf Ranking and resided in the top-10 for over 450 weeks. Recently, he was selected as the 2016 U.S. Ryder Cup Captain, to be held at Hazeltine National Golf Club (Chaska, Minn.) Sept. 30 – Oct. 2. This marks Love’s second appearance as Ryder Cup Captain, holding the same duties in 2012. Stricker currently plays on the PGA TOUR with 12 wins in his career, including the John Deere Classic three times. He has also made five appearances in The Presidents Cup and three in the Ryder Cup for Team USA. Reaching No. 2 in the Official World Golf Ranking, he boasts 253 weeks in the top-10. Stricker’s most successful season occurred in 2009 when he recorded three tournament victories and finished second on the TOUR money list. In late 2015, Stricker was named as a 2016 U.S. Ryder Cup Vice Captain alongside Tiger Woods and Jim Furyk. For the ninth consecutive year, golf industry leaders will meet with Members of Congress, the Executive Branch and federal agencies to discuss golf’s nearly $70 billion economy, $4 billion annual charitable impact and many environmental and fitness benefits. Throughout the day, participants will share stories about the game’s 15,000-plus diverse businesses, the two million jobs that are impacted by the industry, tax revenue creation, tourism and ecological value. National Golf Day in April 2015 was the most successful to date with over 120 Congressional meetings in one day. Globally, the #NGD15 Twitter campaign eclipsed 37.6 million impressions and reached 19.8 million accounts, including 3.3 million users in a one-hour span. WE ARE GOLF, created in 2010, is an industry coalition that communicates the economic, charitable and environmental impact of golf, as well the health and wellness benefits of the game and the affordability and accessibility of golf, to Members of Congress, the Executive Branch and regulatory agencies. The goal of WE ARE GOLF is to ensure that laws and regulations that impact the golf industry are equitable and appropriate to an industry that generates nearly $70 billion in economic impact annually, impacts close to two million jobs and generates nearly $4 billion in charitable giving each year. SANTA ANA, CA. – (March 9, 2016) – For the third consecutive year, Yokohama Tire Corporation (YTC) is teeing it up with the Ladies Professional Golf Association (LPGA) in Prattville, Alabama. That’s where the 2016 Yokohama Tire LPGA Classic will be held May 5-8 on the Senator Course at Capitol Hill along the Robert Trent Jones (RTJ) Golf Trail. Longtime tournament veteran Kris Tamulis is expected to return to the 2016 Yokohama Tire LPGA Classic to defend her championship title, along with top players Stacy Lewis, Ha-Na Jang, Michelle Wie, Cristie Kerr, Yani Tseng, Suzann Pettersen, Ayako Uehara, Brooke Henderson and many others. The tournament, traditionally held in late summer, has been moved to Mother’s Day weekend to enable LPGA golfers to participate in the Rio Summer Olympics. Currently, nearly half of the potential Olympians for women’s golf (representing 18 countries) are in the 2016 Yokohama Tire LPGA Classic field. The 2016 Yokohama Tire LPGA Classic will once again benefit, KaBOOM!, a national nonprofit dedicated to ensuring that all children get the balanced and active play they need to thrive. Proceeds from the tournament will help fund building another new playground for kids, like the one YTC and KaBOOM! built in Southern California in 2015. Potential Olympians– These 28 Olympic hopefuls (based on today’s International Golf Federation’s Top 60) are in the current Yokohama Tire LPGA Classic field: Stacy Lewis, Ha-Na Jang, Amy Yang, Sei Young Kim, Brooke M. Henderson, Suzann Pettersen, Cristie Kerr, Anna Nordqvist, Minjee Lee, Pornanong Phatlum, Karrie Webb, Candie Kung, Charley Hull, Carlota Ciganda, Karine Icher, Julieta Granada, Catriona Matthew, Mariajo Uribe, Christel Boeljon, Alena Sharp, Paula Reto, Kelly Tan, Dewi Claire Schreefel, Gulia Sergas, Gaby Lopez, Laetitia Beck, Giulia Molinaro and Alejandra Llaneza. The Olympic ranking changes each week and will be finalized in July, two months after our event. Other High Profile Players in the Yokohama Tire LPGA Classic Field: Brittany Lincicome, Na Yeon Choi, Chella Choi, Natalie Gulbis, Christina Kim, Belen Mozo, Ai Miyazato, Se Ri Pak, Sadena Parks, Morgan Pressel, Beatriz Recari, So Yeon Ryu, Yani Tseng, Michelle Wie and Cheyenne Woods. Funded by the Retirement Systems of Alabama, the Robert Trent Jones Golf Trail was built to help expand tourism, recruit industry and attract retirees, thus strengthening the state’s economy while adding to the quality of life for all Alabamians. The RTJ Golf Trail opened in 1992 and has welcomed more than 11 million rounds of golf. From Mobile Bay to the Tennessee River, the RTJ Golf Trail has 26 courses on 11 sites across Alabama. The LPGA is the world’s leading professional golf organization for women. Founded in 1950, the association celebrates a diverse and storied membership with more than 1,700 members representing 29 different countries. With a vision to inspire, empower, educate and entertain by showcasing the very best of women’s golf, LPGA Tour Professionals compete across the globe, while dedicated LPGA Teaching and Club Professionals (T&CP) directly impact the game through teaching, coaching and management. The Symetra Tour consistently produces a pipeline of talent ready for the world stage. The LPGA is headquartered in Daytona Beach, Florida. Follow the LPGA on its television home, Golf Channel, and on the web via: www.LPGA.com, www.twitter.com/lpga, and www.youtube.com/lpgavideo.